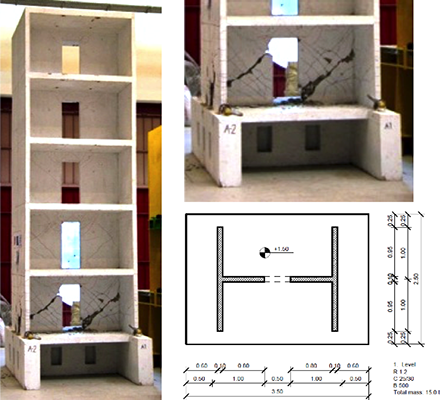 The main objective of the project is to experimentally study the interaction between piers and floors in RC coupled walls. The influence of slabs to this interaction and redistribution of demand between components at different seismic intensities, as well as numerical models, which can more reliably simulate the response will be studied. Buildings with RC walls have been one of the most frequently and successfully used structural systems to resist seismic action. Nevertheless, in several cases (in particular during the recent earthquakes in Christchurch and Chile) some walls were heavily damaged, requiring high cost of repair or even demolition. In a large number of such structures the damage was due to poor understanding of the complex interaction between the floor system and wall piers. This problem was therefore recognized as one of the priority research goals within the Virtual International Institute for Performance Assessment of Wall Systems (NSF SAVI Wall Institute) joining together most of the leading researchers in the field from all over the world. However, the experimental studies of coupled RC walls, which could significantly contribute to the clarification of these response mechanisms, are very rare. Due to the specific geometry and high resistance of walls, experiments have required large and costly experimental facilities. This problem becomes particularly relevant when floor to walls system interaction is studied. Furthermore, most research has been focused on rectangular walls, which might not adequately represent wall behaviour and the wall-floor interaction in real structures where non-planar walls are commonly used. It is foreseen that proposed experiments will be performed at the large-scale shake table at Institute of Earthquake Engineering and Engineering Seismology (IZIIS) in Skopje. For decades the proposing institution has got fruitful cooperation with IZIIS, which has a long-term experience in conducting successfully a variety of shake table tests, and has been shown to be very cost-benefit effective. This guaranties not only the successful outcomes of the tests, but also the feasibility of the proposed complex research program. Two 1:2 scale 3-story coupled walls will be tested, each with two T-shaped piers and a tributary floor system. Two levels of coupling will be analysed to study the interaction between the floor system and wall piers: 1) In one specimen the piers will be coupled only by the slab; 2) In the second specimen, the level of coupling will be increased by means of coupling beams. The shape and the reinforcement of the piers will provide realistic representation of the floor-pier interaction as well as realistic boundary conditions for the floor system. Following the frequent practice in many countries, piers of the second specimen will be coupled by RC beams with diagonal reinforcement designed to provide resistance to the shear demand. The improved numerical models and the findings of the experiments will be used to propose adequate design procedure, which might be included into the future versions of seismic codes, in particular, Eurocodes. The proposed research is compatible with the work of the project partner UCLA, particularly in the frame of NSF SAVI Wall Institute, which has been established with the main goal to improve the design practice for RC walls and wall systems, and to develop the appropriate tools to achieve this goal. Through the partners of the Institute, the results of the project will be efficiently disseminated.